For those of us in the Northern Hemisphere, summer is officially beginning. 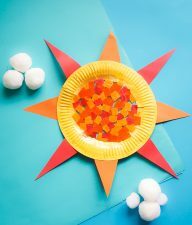 We love to plan a special craft and snack to celebrate the summer solstice. 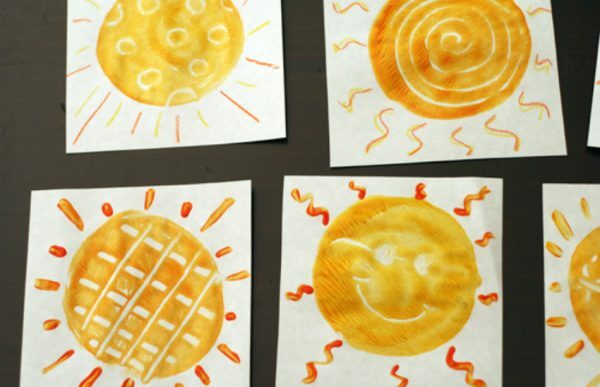 This year we made some cheery sunny monoprints to help us welcome summer. 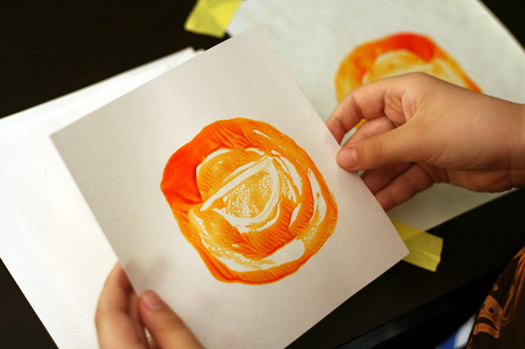 Making monoprints is one of my girls’ all-time favorite art techniques! 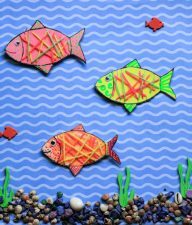 You won’t need a lot of supplies for this project, plus it’s a great one for kids of varying ages. Let’s get printing! 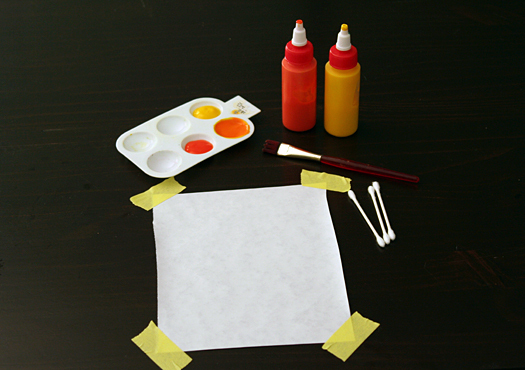 Set-up your painting area. We used freezer paper this time (shiny side up), but we have also done this right on the table many times. An upside-down cake pan works great, too. 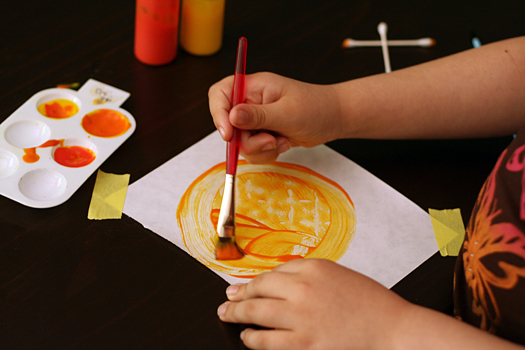 Load your brush with paint – one color or more – and paint a circle. You want a nice layer of paint, but not too thick and blobby. Now, use a Q-tip to draw designs on your sun. We tried zigzags, polka-dots, happy faces, wavy lines, spirals, and anything else we could think of. If you don’t like how your design looks, just smooth out the paint and start over! When you are happy with your design, it’s time to make a print. 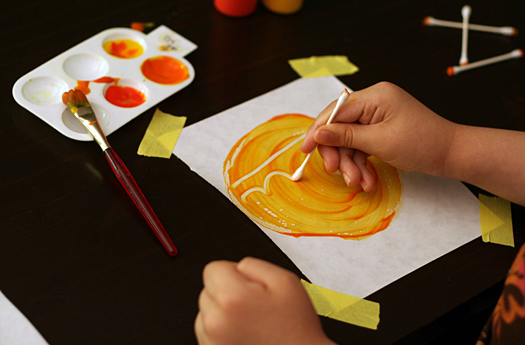 Gently lay a piece of plain paper on top of your painted sun. To keep your design from smearing, we found that pressing or patting the paper worked better than rubbing. 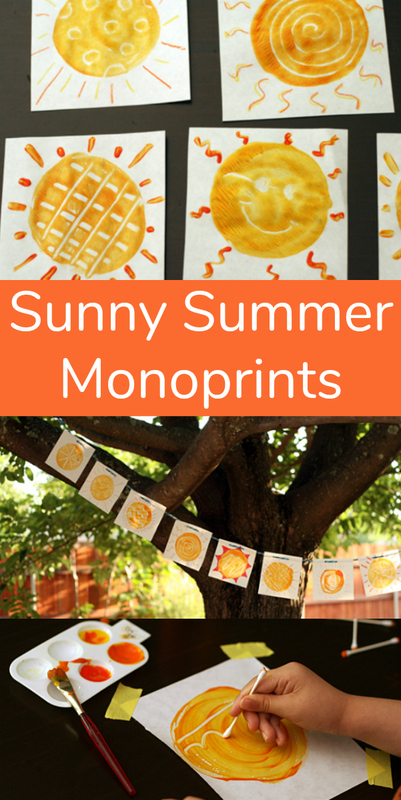 Lift your paper off and check out your sunny monoprint! Continue making as many prints as you like. We just repainted our same circle and made new designs. The process of drawing and printing is kind of addicting, so be sure you have a big stack of plain paper ready to go. For the finishing touch, we added rays with a combination of paint, crayons, and markers. The girls tried to make each sun unique, and I think they succeeded! 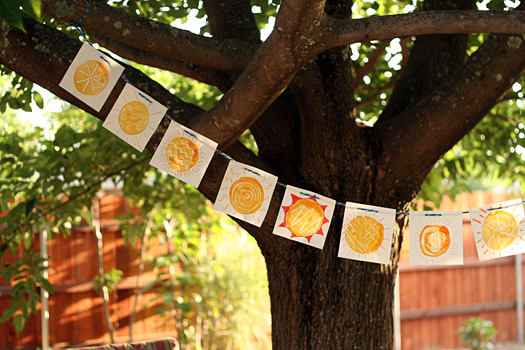 We decided to display our collection of sunshine monoprints on a banner. 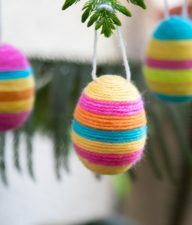 Punch two holes in the top of each print, and string them on ribbon or yarn. I love how cheerful and happy our banner looks. My kids and I did this last night and it turned out so great! It’s our first time celebrating summer solstice and we did this as our first activity. The kids were so proud of their work and we hung ours over the nature table. It looks perfect. Thanks for sharing this great and simple idea! 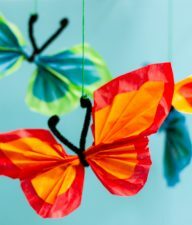 These look like fun, and they’re so bright and cheerful! Gotta try that! My little guy would enjoy it a lot!